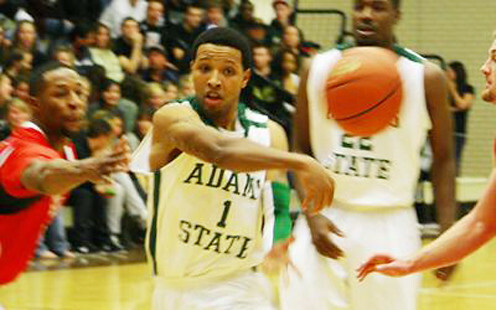 The Adams State Men’s basketball team maintain their perfect regular season record over the weekend with wins over RMAC opponents Colorado State University- Pueblo and University of Colorado- Colorado Springs. In a thrilling game, the Grizzlies opened their Rocky Mountain Athletic Conference (RMAC) schedule on Friday night at Plachy Hall, where poor free throw shooting down the stretch nearly proved costly in a 70-69 win over the ThunderWolves. Senior Deray Wilson (Anchorage, Alaska) was sent to the line with 15 seconds to play and a chance to increase the lead, but missed both attempts, part of a 6-for-15 second half from the free throw line for ASC. The Grizzlies were called for a lane violation on the second, giving the ThunerWolves the last shot, but a 3-point attempt from Jed Knafelc, who scored all eight of his points in the second half, was wide of the mark. It was the Grizzlies’ eighth straight home win dating back to last season, and upped their record to 4-0 overall and 1-0 in the RMAC this season. CSU-Pueblo left the game with a 3-2 overall record and an 0-1 league record. In the next game, against University of Colorado- Colorado SpringsAdams State led by as many as 17 points early in the second half Saturday night, but for second half 3-pointers and 24 Grizzly turnovers allowed RMAC foe UCCS to make it close as ASC scored a 69-65 victory at Plachy Hall. The Grizzlies are now 5-0 overall and 2-0 in league play, equaling their start from last season and now remain just one of three RMAC teams without a loss this season, and one of five to be undefeated in conference play. The Mountain Lions dropped to 1-7 overall and 0-2 in the RMAC after having lost to Fort Lewis on Friday. Junior Jack Osborn (Hobart, Tasmania, Australia) recorded his first double-double of the season and helped the Grizzlies stake out to a 38-30 halftime lead with eight of his 14 points in the first 20 minutes. He would finish with 14 points and 11 boards, and was one of the Grizzlies leaders at the free throw line where he hit 6-of-7 attempts. A 16-point lead with 11:40 to play in the opening period was diminished as a Jeff Isaac jumper capped a 21-4 UCCS run that put the Grizzlies in a 27-26 hold with 3:47 before the half. Senior Robby Hanzlik (Denver, Colo.) and junior Kaimyn Pruitt(Los Angeles, Calif.) both reached double figures in scoring. Hanzlik was 4-of-11 from the field with a pair of triples en route to 12 points, while Pruitt went 0-for-2 from the field but hit all 10 of his attempts from the charity stripe. Senior Jamiko Verner (Denver, Colo.) dished out a game-high seven assists while recording five steals in the game. After leading a Grizzly effort that relied heavily on defense to get off to a 2-0 start in Rocky Mountain Athletic Conference (RMAC) play, Verner was tabbed as the RMAC/Baden Defensive Player of the Week, league officials announced Monday. Verner swiped 11 of the Grizzlies 25 steals over the weekend, taking 5.5 per game, and also grabbed a pair of defensive rebounds during the weekend sweep. The Grizzlies will play just once next weekend, hosting Fort Lewis at Plachy Hall on Saturday night. The Skyhawks are also 2-0 in RMAC play this after topping both the Mountain Lions and ThunderWolves, and own a 4-2 overall record. They topped CSU-Pueblo by a 66-55 tally in Durango Saturday night. FLC won both match-ups against the Grizzlies last season, and escaped Plachy with a 78-75 win on Jan. 29. ASC’s last victory against the Skyhawks came on Feb. 23, 2010, by a score of 90-87 in overtime at Plachy.